Parga is a picturesque small town on the north-western coast of Greece, in the area called Epirus. Parga town is situated in a sheltered bay and its houses climb the mountainside from seaside to the top. It's got a castle, one large beach on the other side of the mountain called Valtos Beach, two smaller beaches in town, an island across the bay with a chapel on, a pier for the tourboats and fishingboats in the middle of town and another beach a couple of kilometers south of town in the next village called Lichnos beach. 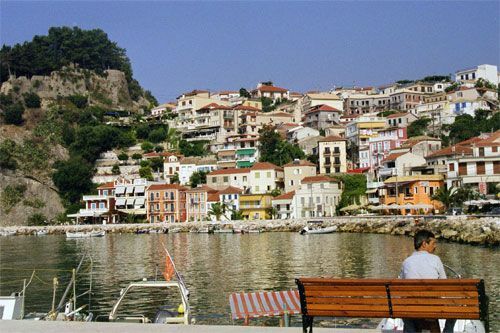 Parga is surrounded by mountains covered with olive groves. The olive groves are actually more like olive-woods, than groves. The trees are quite large. The only other place where I've seen olivetrees this big is at Corfu. Apart from Parga, and some smaller villages nearby, this area, called the Epirus, is mountaneous and rather empty. It is far between the villages. Parga was a positive surprise. It is sometimes advertised as a small town on the mainland with an island-feeling to it. And that is exactly what it is. It is also still a very genuine greek small town. You get the real greek food at most places (if not all), not the tourist version, and people are just very nice. There are as many greek tourists as people from elsewhere in the world. Wintertime Parga has about 2.500 inhabitants. During tourist-season, many more. With the nice town, the harbour and its restaurants, the nearby beaches and the good food, Parga is worth a visit. It is a quiet and relaxing place. Not for those who want a lot to do and having a party but for those who want to relax and take it easy and to make trips into the mainland and some of the nearby islands like Paxos and Antipaxos. The big island of Corfu is also not all that far away. You reach Parga by flying to Preveza Airport and than travel north for about an hour. The nearest large town is Ioannina in the north, which like Parga, suffered under the rule and occupation of Ali Pasha. During that time the people of Parga were evacuated to Corfu. They eventually came back.